Jim Harbaugh won all the major battles. But the Southeastern Conference won the war. You want to battle for recruits via satellite camps? Not this year. Probably not next. 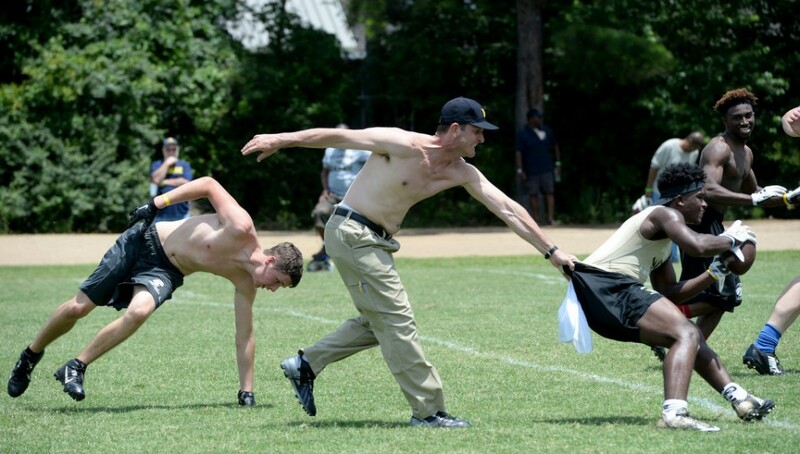 Harbaugh held a sometimes-shirtless tour of the South last summer amid much hoopla, helping coach camps in various steamy locales. The camps served many purposes, including the chance to teach kids the fundamentals from a brand-name coach and his staff while doing so at an affordable race. Well, 14 SEC schools, for one. The SEC had already taken a hard line on satellite camps, banning league coaching staffs from participating in camps more than 50 miles off campus. In fact, Michigan and Harbaugh weren’t even on the radar when the SEC rendered its decision. The SEC reasoned that banning camps protected turf and kept one rival from opening shop in the backyard of another. The ban also kept some semblance of normality in the lives of college coaches, whose vacation schedule is limited to about a 48-hour window in mid-June. When Harbaugh embarked on his camp tour, it drew criticism from across the SEC. Auburn’s Gus Malzahn saw the impact up close after Harbaugh’s incursion into Prattville, Alabama – just over an hour from the Auburn campus. Malzahn said he merely wanted everyone else to follow the SEC’s lead. A year later, Malzahn’s biggest rival, Alabama’s Nick Saban, argued that the debate was much ado about nothing. In the end, the NCAA agreed with Saban, Malzahn and the SEC, voting last week to ban the camps. Of the Power 5 conferences, only the Big Ten voted to allow camps to continue. Yet these camps do have value.